Social media has come a long way from a single email to the vastly populated social media sites today. Life has completely changed today and social media has impacted many different spheres of our lifestyle. It’s hard to imagine how life would be and how we could carry on without social media. If you really want to define the term Social Media- it is a online media which not only gives you the information but it also interacts with the user while supplying information at the same time. The interaction could be simply stating your daily life update, posting a poll on some recent news or just sharing your views on something. People are using social media for a number of purposes. Some use it for personal reasons to remain in touch with their friends and families while others utilize it as a powerful tool in online marketing. There are many online marketers who utilize social media to carry out successful campaign activities and yield more profits. • With the help of social media you can connect easily and communicate instantly with people. ‘Instant’ is the word used here! Social media will allow you to share the important information with the masses in seconds. This is one of the prime reasons why social media has dominated the world of communication today; it just meets its purpose so effectively and so quickly. Your audience can get instant access to not just plain news but to all the facts, ideas and views related to the same almost instantly. Usually you can get all the space to fit in the required information. • Using social media you can enhance your entire branding. This has worked great for online marketers. Many organizations have enhanced their online recognition and have established their reputation using this mean. This has been not just because they use social media as a medium of promoting their business but also because they use it as a mean to know and alter the perceptions of their audience about their products and services whenever possible. • Social media has impacted the world of online marketing in a big way. There are several strategies related to the same, followed by SEO experts to pull up website rankings in the web. This Social media has helped internet marketing significantly. 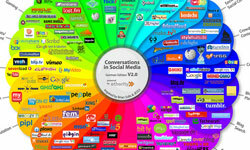 Some special social media websites are used to implement these internet marketing strategies. • Social media is extremely cheap as compared to the other media. People spend so much on advertising and promoting. Social media platforms however can be used for free. These platforms can be used to update profiles and look for reliable contacts. As a result social media can be easily used by small businesses. These small companies use these sites to publish various promotional materials. Social media also does not have limit for access. It has no strict restrictions and is generally open to all. It requires no prior large investment and is used by many. • Social media websites are very simple to use and does not require any specific skills for the task. You just require internet connection for the same. There are many websites you can choose from these are generally user-friendly and easy to figure out. On the other hand using other media tools would require specialization as well as training. • Social media websites can also be used to reach the global audience with much ease which is not possible with other mediums. Targeting global audience would be extremely expensive, probably close to impossible. Thankfully it is now no more a tough job with World Wide Web as well as social media websites. Some important social media websites include those related to Social Bookmarking, Social Networking, Social Photo, Social News as well as Video Sharing Wikis. All these are used for special purposes. Another important fact you should not miss out about social media applications is the flexibility of altering or modifying it. It is not as rigid and difficult to alter as in case of traditional media. Social media can be modified and edited almost instantly. Businesses have harnessed the power of this new tool category in a great manner for various purposes. Social media has in a way changed the lives of the common masses altogether; people are now much more sensitive, receptive and aware of the things happening around them. It has in fact worked to make this world a smaller place. Jack Sam White spends most of his time writing for SEO in Dallas, Red Spot Design. He has been a writer for several years and has also served as an online marketing specialist.